The numbers are in, and if you’re in the U.S. travel industry, they are not uplifting. A High Court in Kumasi in the Ashanti Region has issued a bench warrant for the arrest of CEO of the Jospong Group of Companies, Joseph Siaw Agyapong. The General Legal Council is warning it may not admit students this year to pursue professional law programme at the Ghana school of Law if the passage of the Legislative Instrument (LI) to regulate entry into the school is delayed. Sadio Mane scored a hat-trick as Liverpool marked their first Champions League knockout game for nine years with an emphatic victory at Porto in their Champions League last-16 first-leg tie. The Portuguese forward scored a late close-range strike after his penalty had cancelled out Adrien Rabiot's opener at the end of a thrilling first half. The Kumasi Traditional Council has initiated steps to address the issue behind the bloody protest at Foase over the relocation of the Atwima Kwanwoma District capital. 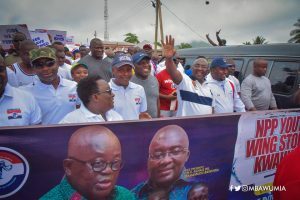 Vice President Dr Mahamudu Bawumia has joined many others across the world in showing love to their better halves on Valentine’s Day. I am not sure if Ghana could have avoided the vetting element in the appointment of a Special Prosecutor. In my minority view, the euphoria surrounding the vetting process is elevating the office to a political debate, which is not what the office needs. The Ghana winger talks about the Spaniard’s coaching philosophy which many seem not to like. A 17-year-old HIV AIDS sufferer says her father has sent her out of the house because of her status. A Senior Research Fellow at the Ghana Center for Democratic Development (CDD-Ghana), Dr. Kojo Asante, has charged the youth to exhibit a strong sense of leadership and work towards having a progressive and all-inclusive country. It never ceases to amaze me the beauty of your heart. The deep love and care you have for me. But for you, I never knew love could be this sweet. Two alleged lesbian girls have been rescued by the police in Tafo in the Ashanti region after a mob threatened to beat them up. President Akufo-Addo says he has instructed the ministries of the Interior, Roads, and Highways, and Transport to draw proposals to improve road safety. The year on year inflation rate for the month of January dropped to 10.3 percent from 11.8 percent recorded in December, 2017. The United States will overtake Saudi Arabia and Russia next year to become the world’s largest oil producer.